It’s funny how a few thousand rounds of a particular caliber sounds like a lot until you can’t get any more. Then it’s not nearly enough. [This current ammo crunch is much worse than the last one. Maybe it just feels that way to me because I’m shooting more now, but honestly this one feels worse. The crunch from supply to bare shelves was much more rapid and caught many off guard, not to mention this one’s also happening next to a firearm and magazine crunch. During the last crunch I could still find 22lr along with many other calibers, prices went up, but it was by no means a fully dry supply. 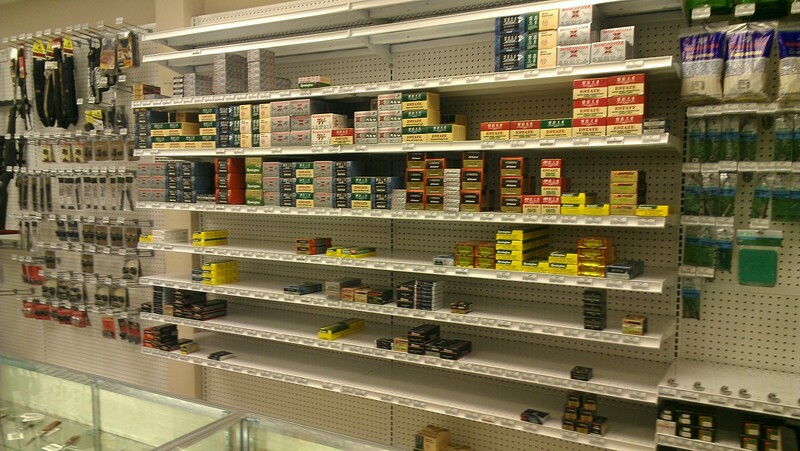 The ammo shelf at the local Ace Hardware. I bought a new gun in November and this was a new caliber to add to my pen. I planned on spending the next couple months stocking up a ready supply for matches and practice. Yeah that plan flew right out the window. Luckily I have a small deal with my local neighborhood dealer and am getting ammo to get me through the USPSA matches now. I would like to go back to shooting steel as well but honestly I don’t want to expend the ammo. I could shoot .22 but I don’t have nearly the surplus I would like. I had a few things on my list for restocking this year and honestly I think those plans are going to get pushed out. Alan’s statement nails this one on the head. I felt I had enough until all the sudden my prospects for replenishment fell to 0. Even getting your hands on reloading components is down right difficult if not impossible. I’m afraid with the severity of this crunch, even if the bubble burst tomorrow, it’s going to be a while before ammo gets back on shelves. Tagged Ammo Drought, Firearms, Quote. Bookmark the permalink. Other times I agree, agreeing that having a diversity of guns in a wide variety of calibers is a good thing, as it allows you to buy and use a wider variety of whatever is available. I figure at LEAST four common and two uncommon each, for rifle and pistol, is a good starting point. .223, .308, .30-06, 7.62×29, 8mm, 7.62×54, and several less common, and .22 LR, 9mm, .40 S&W, 10mm, .45 ACP, .257 Mag, .44 Mag, and several less common. A few swap-able barrels to add calibers, too. Yup, you should ALWAYS be able to find some ammo. And, of course, the left keeps talking up conservations and recycling, so stocking up on reloading components is a fine plan, too.